Here I will explain “The Microsoft Office Access database engine cannot open or write to the file ''. It is already opened exclusively by another user, or you need permission to view and write its data.” problem solution in asp.net using C# and VB.NET. In previous articles I explained Import/upload data from excel to gridview in asp.net, Export selected rows of gridview to excel/word document, Export gridview data to pdf in asp.net and many articles relating to Excel, Gridview, SQL ,jQuery,asp.net, C#, VB.NET. Now I will explain how to solve the problem of “The Microsoft Office Access database engine cannot open or write to the file ''. It is already opened exclusively by another user, or you need permission to view and write its data.” in asp.net using C# and VB.NET. In one application I got requirement like Read or Import data from excel sheet to gridview and upload excel data to SQL database once implementation completed I tested it in local everything working fine. After I deployed application in server machine and tried to run then I got an error like "The Microsoft Office Access database engine cannot open or write to the file ''. It is already opened exclusively by another user, or you need permission to view and write its data”. 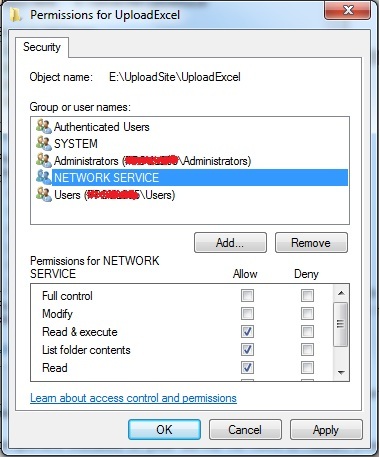 To solve this problem we need to grant the NETWORK SERVICE account modify permission on my folder where our excel files will sit for that follow below steps. Once set network service permissions run your application i hope this will fix your problem. 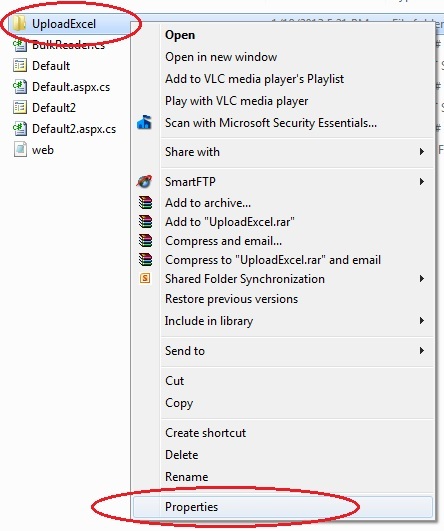 You will definitely get this error since the file is posted on file upload control it is used by it ... so it says 'opened exclusively'.The solution is that u first save the file on server then read it. but how to set permission programmatically ? I am trying to access MDB files placed on remote machines from a central server where SQL is running and it is giving me same error. What should i do? SIR i'M GETTING SAME ERROR.. The Microsoft Office Access database engine cannot open or write to the file ''. It is already opened exclusively by another user, or you need permission to view and write its data. Sir, still the same error. 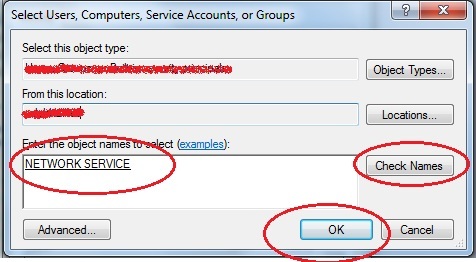 For "network service" select and save modify right also and you all won't get any error further. If you follow above process still getting the error, The problem is with the File Upload Control. it is generating the error. If we replace the Path manually(i.e. DataSource="c:\sample.xlsx" ) able to execute. I am also getting same error. pl give me the solution. it urgent for me..i am waiting any one can reply fast. Hi, with your above code the excel sheet is being displayed in my webpage in the gridview but is not getting inserted into my database. How do i get the data to my table in database? permission to view and write its data." Please suggest me a proper solution for this problem, I had tried a lot but didn't found solution for this error. In my PC only .how to resolve it. other PC's it works fine. hi my error The Microsoft Jet database engine cannot open the file ''. It is already opened exclusively by another user, or you need permission to view its data. Sorry sir it is not working..
System.Data.OleDb.OleDbException: Server connection error in my application. I am getting this error in Visual Studio 2012 c# asp.net aspx page. The Microsoft Office Access database engine could not find the object xls. conString = @"Provider=Microsoft.ACE.OLEDB.12.0;Data Source=" + FullPath + ";Extended Properties=\"HTML Import\""; Thanks Mr. Suresh, your tutorials are quite good. i have a problem with the postback, all works fine but dont show the grid with data says: "no file selected" but i put breakpoints and the grid has data nut sont show it in the postback. The Microsoft Access database engine cannot open or write to the file ''. It is already opened exclusively by another user, or you need permission to view and write its data. on "Advance Security Settings" click Share tab. click add. click object type. include computer. click OK. Under 'Enter the object name to select' add the name of the computer your using to access the file. then click 'OK'. then apply.